Mark worked in collaboration with Jon Hicks, a seasoned street art performer to create an unique outdoor performance. They developed ‘Works’ through a period of intense experimentation in partnership with SeaChange Arts at the Drill House, participation and creation centre. Mark and Jon a.k.a the ‘workmen’ enter the performance area where they start to remove from a garden shed an assortment of curious everyday objects, choreographed to music. The audience awareness of the workmen’s bizarre behaviour grows as the low key, deadpan delivery intensifies with some gentle physical comedy. As they watch intrigued, slowly a purpose for the objects emerge, as the space is transformed. The on-lookers trust the skill and precision required by the workmen, but there is a tension in the belief the whole thing could collapse like a house of cards. The finale is a chain reaction, as objects knock into one another, rolling, pushing, lifting, as energy transfers through the Works. The function becomes clear, as the crescendo builds into a spectacular climax. 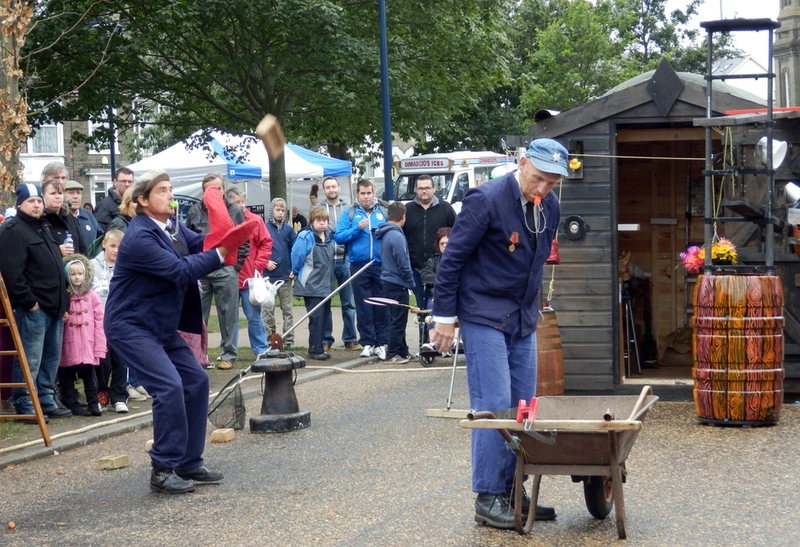 The Performance was premiered at the Out There Festival on the 14th & 15th, September 2013 in Gt Yarmouth. Works was a great success and is being developed to tour Festivals across Europe in 2014.